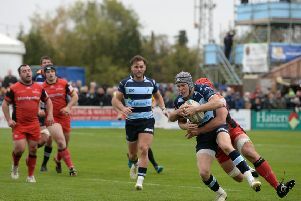 Bedford Blues welcomed Championship action back to Goldington Road with an impressive bonus point 64-20 victory over London Welsh. Tries came courtesy of Pat Tapley, Justin Blanchet, George Perkins, and Piers O’Conor along with two each for Peter White and Jordan Burns. The Blues went in at half-time leading 22-13, before a fantastic performance in the second half along with six tries secured an important victory against the Exiles. London Welsh took the early advantage through former England international Olly Barkley who sent over a penalty in the third minute. Bedford didn’t take long to respond, however, as their first real attack turned into a try. Tom Griffiths broke with the ball before offloading it to Jordan Burns who went crashing over, allowing Jake Sharp to add the extras. Bedford’s lead was cut short almost immediately as they were penalised at the breakdown, allowing Olly Barkley to send a penalty over the uprights to bring the scores to 7-6. Barkley’s kick seemed to have given the Exiles motivation as they edged closer and closer to the line, but Bedford got hold of possession through Burns who looked to clear his lines. However, his kick was charged down by Brendan Snydman who darted over the line before Barkley added the extras. The Blues were on the back foot for a short phase of the game before Sharp played in Tapley who sprinted past the remaining Welsh players before dotting the ball down. Sharp sent over the conversion, putting Bedford back in to a 14-13 lead. Bedford carried on applying pressure to the Welsh defence and it certainly took its toll as Barkley was sent to the sin bin for slapping the ball down, but Sharp sent the penalty just wide. The Blues took advantage of the extra man on the stroke of half-time as Pat Tapley was tackled just short of the line, allowing Burns to swoop in and bag his second try of the afternoon. Sharp sent the conversion over to give Bedford a 22-13 lead at the break. Bedford came out in the second half with their sights set on extending their half-time lead and, three minutes after the second half whistle, Tom Griffiths broke with the ball in the Welsh 22 before sending Le Bourgeois over in the corner - allowing Sharp to add the extras from a difficult angle. Bedford looked relentless at this stage as they went in search for their fifth try. London Welsh picked up a scrum in their own 22 but the Blues pack dominated proceedings, turning over possession before Griffiths linked up well with Le Bourgeois to send O’Conor away down the wing before grounding the ball. Sharp missed the conversion. The Exiles did manage to score another try through Ben Pienaar but it was nothing more than a consolation. Ryan Glynn spotted space on right wing before sending a cross-field chip in to the path of Pienaar who dotted the ball down, allowing Barkley to add the conversion bring the score to 36-20. Bedford resumed their dominant performance as they added a sixth try through super sub White. Within minutes of being introduced into the game, White pounced on a loose ball just in front of the Exiles posts and the scrum half ran directly under the posts, giving Myles Dorrian an easy conversion. In the final 10 minutes of the match, Blanchet went over from close range, allowing Dorrian to add the extras - meaning Bedford had hit the 50 points mark. But the Blues didn’t look like stopping there. Captain Nick Fenton-Wells broke away with possession almost immediately after the restart, and the number 8 charged towards the line before unselfishly offloading the ball to Perkins touch down. Dorrian followed up by sending the conversion over the uprights. Bedford added one final try right at the end through White. Le Bourgeois exploited the Exiles defence with his pace before sending the ball over to White who grounded the ball under the uprights, giving Dorrian another simple conversion to make it 64-20. Bedford’s victory extends their unbeaten run to 4 games in all competitions. The Blues’ next game sees them travel to play Nottingham at Lady Bay next Sunday.